An affair is a tricky thing to handle because there is always more to it than meets the eye. This is true as much in life (I would imagine) as it is in literature. But, when an affair is written down in a book and all the details are laid out, the reader can go back and double-check things, analyze the quality of someone's lie or whether this hotel scene reads too much like a previous one – and, if so, what does that mean? When it comes down to it, we're just trying to understand how it happened. Why did they cheat? Were they destined to leave their respective marriages or would it never have happened without their meeting. Like I said, it's tricky, although that certainly hasn't stopped people from writing about it, including Anne Enright, whose novel The Forgotten Waltz tells the story of an affair and all its little, mundane details. The novel begins now, in the present, after the affair has gone public and the participants have left (or been forced to leave) their respective spouses. Gina, the narrator, is basically going back over everything in an effort to parse out the details – whether for the pleasure of the memories of a deep desire to understand it isn't immediately clear, but the tone of her reminiscences is definitely split between the desire to honestly explain things and justify/reinterpret them. Such is the way retrospect works, though. It really is almost impossible to look back at moments and see them without the filter of everything you know follows. Did that moment, that look, that brush of skin really mean something at the time, or is it a catalyst you can see only when looking back? This is the kind of question Gina seems to be asking, but it's never clear that she really wants an answer. Gina's partner in all this – because affairs are not singular acts – is Seán Vallely, a neighbour of her sister's who has a daughter the same age as her niece. This is how that meet, actually. Sean and his wife attend a summer barbecue at Fiona's house and Gina comes along to help out. This was six years ago, she says, and she returns to the moment when she first say Seán again and again. Did she know at that moment? Could she have known all that time ago? What does it mean that she remembers it all? Gina never overtly asks these questions, but her ability to recall (or at least claim to recall) the minutiae of these moments is indicative of her search for understanding – maybe the answer is in the turn of his cuffs or the rustle of wind through his hair. But before you get the impression that this is nothing but soppy memories and a woman crying "why?" to herself, let me tell you, Enright is deeply funny. The amusement and strange observances that are part of everyday life – no one ate the chicken skin at dinner – are integral to the novel, and Gina has such a blunt and almost shocking way of saying things that she jars you back to the reality that she is, for all intents and purposes, a real woman who has stuff going on in the present day as much as she did in the past, and every once in a while she chastises herself for her own nonsense. Gina's life did not end with the affair, but neither did it begin there, it just became more complicated. Gina is a complicated character, just like most real people, and Enright does not pretend to unfold her for you. Instead, you get glimpses at her childhood and her home life and the way she sees herself just in the way you might with a long-time acquaintance or colleague or even friend. You can know only so much, because some things just don't fit well into words. 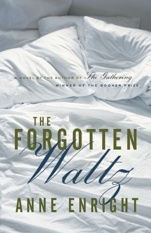 The beauty of The Forgotten Waltz is in its little details – the kinds of things you might notice but never mention, an awkward hand here, a scarf there, taking the bus – and although the emotional is a confusing jumble of love, confusion, distrust and joy, Enright does not allow you to leave feeling smug. The saying is typically that it takes two to tango, and it's telling that Enright eschews that spicy, high energy dance for the image of a waltz, which is classical, fluid, and done with a pair clasped tightly to one another. Gina, at the end of the novel, is starting to realize the tangle of steps that led her to where she is – she knows, as Enright says, what she's done, and she's prepared to keep going. Anne Enright is one of my favorite authors. She writes of the Dublin,I love with lyrical language , and a loving insight into both the city and the characters in her story. Her characters are memorable and true to life.her writing style is fluid ,easy to sail along.highly recommended.